Michigan emergency financial management law “a violation of constitution,” say residents. While the country watched the protests in Wisconsin spill into the State Capitol Building, Michigan Gov. Rick Snyder was passing a controversial bill that many consider a direct attack on the constitutional rights of the citizens of Michigan. Public Acts 4-9, also called The Emergency Financial Management bill, gives already existing “Emergency Financial Managers” (EFMs) sweeping new powers, allowing them to literally suspend the entire elected bodies of municipalities they deem to be failing, and suspend collective bargaining agreements with unions for up to five years. Immediately after the bill passed, an EFM took complete control over the city of Benton Harbor as well as Detroit's public school system. EFMs are also in power in Pontiac and Ecorse. Many Michigan residents, especially those experiencing poverty or hanging on to medium-income jobs, are outraged. Protests, lawsuits from the American Civil Liberties Union and local municipalities and calls for Governor Snyder to be recalled have unfolded with the bill's passing. He and hundreds of others have been organizing and participating in demonstrations, lawsuits and other forms of protest against the bill. Benton Harbor residents say that Whirlpool, the world's leading manufacturer of major home appliances, and which once employed many in Benton Harbor in manufacturing jobs, might have a role in the EFM law as well; State Rep. Al Pscholka, who introduced the bill, formerly sat on the board of a Whirlpool-funded nonprofit in Benton Harbor now behind a controversial development on the town's beach. And his former boss Rep. Fred Upton is a Whirlpool heir who owns property near the development. 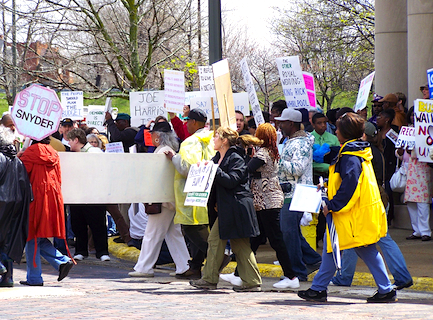 Benton Harbor has long dealt with abject poverty, job loss from outsourcing and low-level corruption. Earlier this month, former City Manager Richard Marsh settled a $192,000 lawsuit accusing other city officials of conducting fundraisers in the name of the city, but not turning over the money, and of burying a report on the city's financial situation. The city government has been profiled for government accountability lapses in the past as well. But many residents say that appointing an EFM with no legal accountability whatsoever will only makes such problems worse. Benton Harbor residents point out the state government's two-faced approach to their community. They see Whirlpool as the real criminal, overshadowing anything a city commissioner could do in a lifetime. At the same time, the St. Joseph-Benton Harbor area was losing over 5,000 jobs. (4) Whirlpool continued layoffs into the '90s, until in 1996 they laid off half of the workers at their Evansville, Indiana, plant. 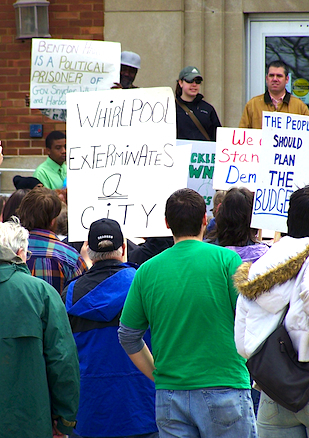 In 2003, as anti-police brutality riots broke out in Benton Harbor, Whirlpool was complaining that further tax incentives in a proposed energy bill were not enough to keep them from moving more jobs overseas. Apparently, the $17.40-an-hour jobs at Evansville were too pricey. Subsidized by these tax incentives and government handouts, Whirlpool last week announced a three-percent rise in first-quarter profits, up from $164 million to $169 million. (15) Whirlpool's sales last year topped $17 billion. So, the “knowledge economy” jobs for which Michigan is paying are being marketed to people outside of Michigan. To keep a clean public image, Whirlpool funds and largely controls a nonprofit in Benton Harbor called the Cornerstone Alliance, which has a revolving door with Whirlpool and the Whirlpool Foundation for its staff members and employees. “They're an arm of Whirlpool,” says Carol Drake of Friends of Jean Klock Park. Carol has been fighting for the preservation of the historic park against a consortium of developers led by Whirlpool. Her organization has tracked the evolution of developers' plans to seize the public park, which she says have been in the works for decades. Their current project is called Harbor Shores, a $500 million golf resort to include luxury homes, a water park, high-end condominiums and other similar upscale amenities. Both Whirlpool and Cornerstone are partners in this development, which will span Benton Harbor's public beach. Jean Klock Park was deeded to the people of Benton Harbor almost 100 years ago, but the central area of it was turned over to developers in 2008. But those commissioners no longer have any power due to Joe Harris' recent suspension of all local government activity through the Emergency Management law. This has led some to believe that the EFM bill is being used here to ensure that the Harbor Shores project continues. Residents point out that Pscholka, who introduced the bill, was vice president of the Cornerstone Alliance's Chamber of Commerce from 1996 to 2004. Julie has been active for many years in the fight to protect the park. Her organization, Protect Jean Klock Park, was founded in 2008 to support federal litigation against the National Park Service, The Army Corps of Engineers and the City of Benton Harbor. “Pscholka was also a staffer for U.S. Congressman Fred Upton (R-MI),” Julie says. Representative Upton owns over $1 million in Whirlpool stock and pushed hard for the privatization of Jean Klock Park. His grandfather was a co-founder of Whirlpool. For its part, Whirlpool has donated former factory land appraised at $20 million in anticipation of development at Harbor and has offered over $15 million in economic assistance and loans. The Harbor Shores plan is being run through a nonprofit called Harbor Shores Community Redevelopment, Inc., a collaboration among Whirlpool, Cornerstone and a new formation called The Consortium for Community Development. The company in charge of developing Harbor Shores, Evergreen Development, was formed in 2005 in anticipation of the project. Evergreen's Chief Financial Officer Jeffery Gilbertson is the former senior director of Financial Operations, International at General Growth Properties (GGP), one of the largest mall owners in the United States. Meanwhile, workers at Baltimore's Inner Harbor were announcing a major campaign against GGP, which parallels the fight in Benton Harbor in many ways. A new report released this week shines light on these issues and perhaps puts the Harbor Shores project in Benton Harbor under a new light. That might sound all too familiar to the residents of Benton Harbor. It was recently announced that the 2012 and 2014 Senior PGA Tournament, brought to you by Whirlpool's own KitchenAid, would be played at Harbor Shores. This is a bit ironic since one of the big promises with the Harbor Shores development is that it will, according to their numbers, create 4,739 jobs. This number has been used in both the media and in the community as the great defense of the project. The figure was first announced in an impact study conducted by students from the Kelley MBA Sports & Entertainment Academy with assistance from the W.E. Upjohn Institute for Employment Research. It turns out the numbers were off by as much as 3,123. The second report puts the total employment count during the highest employment year (which in the report is 2012) at 1,616 jobs. That includes projected tourism employment and development construction. These numbers also don't account for how long those jobs will last, how much they will pay and how much skill they will involve. What we do know from the reports is that the majority of the jobs created will be in construction, meaning they will only last a few years. The promise of low-paying jobs and temporary employment will not lift Benton Harbor's current residents out of poverty. Residents say they have been hearing similar things for years, but little has changed. “They aren't going to bring any jobs that are going to sustain a family,” Carol says. Though there have been some improvements since the harsh years of the late 1970s, unemployment rates in Benton Harbor are still far above the national average (15 percent today with unofficial claims as high as 70 percent) and almost half of the city's residents are now living at or below the poverty line. While the unemployment rate is lower than it was when the 1986 tax incentives started, almost half of the city's residents have moved out since then, which helped bring that percentage down. If poor residents are priced out and forced to other places, the result on paper will be that the overall income of Benton Harbor rose as a result of the Harbor Shores development. “They want us to leave here as soon as possible,” says Reverend Pinkney. As the Baltimore model has shown, developers in positions like Harbor Shores often masquerade as an economic engine for a city while leaching public money to make big profits. “Baltimore's Inner Harbor is a sad example of what broken promises for economic prosperity and jobs can do to a community,” says Ashley Hufnagel, a leadership organizer with the United Workers. A demonstration has been called for in Benton Harbor on June 18, the anniversary of the 2003 riots. Another larger demonstration will take place during the 2012 PGA Championships at Harbor Shores. 6. “Good Jobs First, Layoffs at Whirlpool: Costs to the Evansville Metro Area and Indiana Taxpayers.” Commissioned by IUE-CWA Local 808 and AFL-CIO Industrial Union Council Washington, DC. April 2010. 9. “Good Jobs First, Layoffs at Whirlpool: Costs to the Evansville Metro Area and Indiana Taxpayers.” Commissioned by IUE-CWA Local 808 and AFL-CIO Industrial Union Council Washington, DC. April 2010.